Beauty and health supplies are in higher demand right now than ever before. With sales of over $56 billion in 2015 that are estimated to reach $90 billion by 2020. It would be an understatement to say that the beauty industry is doing well.What this means for you, the beauty store owner, is more customers and more sales! To keep up with such a demanding industry, you need to be sure that your store is up to par. You need to have the right equipment to ensure your customers. Will have an excellent experience when they make their purchase. This is where a solid POS system comes into play. Lightspeed is a multi-platform POS solution that provides users with an all-in-one e-commerce solution. It comes with a full suite of tools for things like inventory management, accounting, and analytic reports. This POS is best suited for those who need a POS solution that covers the wide range of needs a beauty shop might require. Keep in mind, however, that Lightspeed is not just a POS for beauty supply stores. This platform is geared towards helping just about any sort of business grow and expand. Depending on what type of business you need to use the Lightspeed POS for, this will affect your pricing as well as determine what features you will have access to use. Lightspeed has gained a lot of traction, hosting over 45,000 and having processed over $15 billion in transactions on their platform. When it comes to pricing options, Lightspeed offers three different packages from which you can choose. The first package option is the ‘Small’ package and it is geared towards the smaller shops. It is also geared towards those who have just opened their doors for the very first time and maybe only need 1 register. As well as the ability to give up to 5 employees access to the system. This package is priced at $99/month.The second package is called the ‘medium’ package. The Medium package is for those stores who are a little larger or are looking to expand. It does cost a considerable amount more, coming in at $169 per month. But with that price tag, you also get access for up to 10 employees and can be used on up to 2 registers.The last package option is the ‘Large’ package. This one is a lot more robust than the previous packages and it is reflected in the price of $289 per month. Now, what you get in this package includes the ability to give up to 20 employees access, can be used on up to 4 registers. And the option to add additional employees and/or registers for an addition fee each month. Additional employee access will cost you an extra $9 per month. And if you need an extra register, those are $59 per month. What is really neat is that with the additional register you also automatically get access for 3 more employees. There is one main complaint that many people seem to share when it comes to the Lightspeed POS. This is the fact that while the system as a whole looks very nice, the functionality can at times actually feel clunky, and overall, just not flexible. There just simply isn’t much wiggle room with this platform and you get essentially a bare-bones system that looks pretty but performs poorly and carries with it, a large price tag. Overall, Lightspeed is a really solid and well-supported POS system. It is more on the expensive end of the spectrum but it is aesthetically appealing and honestly. If you own a beauty supply shop, shouldn’t your POS system be beautiful as well? And beyond a few hiccups on the back end (that are easily worked around), it’s probably one of the better POS platforms on the market for retail stores. Revel is a feature rich, cloud-based iPad POS system for a variety of businesses but really excels in two industries; restaurant and retail. It comes equipped with all the bells and whistles you expect to get for it’s price tag. Hourly sales can be tracked, inventory management tools make keeping track of stock a breeze, and best of all, it can be integrated with others services such as Apple Pay and QuickBooks. Although it is one of the more expensive iPad POS systems, Revel continues to earn its keep. It is able to cater to just about any need you may have for your beauty supply business. Revel is without a doubt one of the more expensive options on this list. For small beauty shop owners who are just starting out, it is probably best to avoid starting Revel at first. The initial setup fee is a fairly large price barrier for most, and will run you $1,000 just to get started. This is a deal breaker for many, considering that even many of the more well-known iPad POS systems do not have any setup fee at all. As a matter of fact, Revel is the only one on this list that has any kind of setup fee. After you are all set up, you will also have a monthly fee that can range from $70.00 – $200.00. Revel’s monthly price is not publicly available and you will need to head over to their site to request a quote. Apart from being extremely expensive, the Revel iPad POS system also falls short in quite a few other areas. Even after that initial $1,000 fee to get it all set up. You are still left with the headache of making it work the way you actually want it to, and for the less tech-savvy this is a daunting task to say the least. The reporting data is not always accurate, the system has a tendency to get very laggy or just crash altogether, customer service does not seem very well educated in the product, and there are a lot of customers still waiting on iOS 10 compatibility. Revel really does have the potential to be a huge name in the point of sale industry. However, they need to make it more accessible to entry level users, as well as fix a lot of the bugs the system has. This iPad based POS system is indeed rich in features but I cannot recommend it for the average user unless they have a large budget and are tech savvy enough to troubleshoot any problems they run into. Overall, Revel isn’t a bad system outside of the problems I mentioned above. The folks over at Revel have heard all kinds of feedback from their customers and they are actively and constantly working to improve their system based on what the community wants. 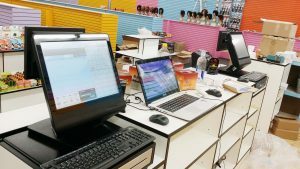 ShopKeep is an iPad POS system that simplifies handling all of your POS needs and is probably best suited for small to mid-size beauty supply businesses. Like the other two iPad POS systems on this list, ShopKeep is feature-rich with a few exceptions. With ShopKeep you have tools to help you do things like manage your inventory, payments and even your marketing. And if you are needing something that is easy to set up and even easier to use, look no further. In comparison to the Revel and Lightspeed POS systems on our list, the ShopKeep software and hardware are the simplest to get up and running. If you already have all the hardware you need for your terminal, such as an iPad, a printer, APG drawer and a card reader, you may forego the hardware offered by ShopKeep. If you don’t already have these things available. You can get ShopKeeps hardware package and they will provide all of the hardware for you to use for $1,099. Aside from that, there is a monthly fee of $49 per terminal. There are no hidden fees or costs for things like service and routine maintenance. The major downside of ShopKeep certainly has to be the customer support. 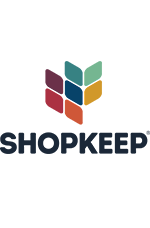 If you scour the web for more than a minute looking for other reviews about ShopKeep. You will more than likely see this topic come up quite often. Everything from complaints of rude support agents to being charged for several months after a customer canceled their account, and everything in between. The second major complaint is the lack of some common features you can typically find in other iPad POS systems. A few of these are lack of integration with other services. A poor inventory system, and the fact that ShopKeep is not cloud-based. The first two are very basic features that you typically get with most of the other iPad based POS systems. The lack of cloud-based support is not a major deal breaker for most but for the price tag, it certainly should be included. Lastly, for an iPad POS system made for general retail, you would think that you would have access to a great number of options, but this isn’t the case with ShopKeep. If that is what you need, you would be much better off with the Revel POS. If you own a small or mid-sized beauty supply store, ShopKeep may be exactly what you need. The low monthly fees are an attractive entry point for most people and with the option to use all your own hardware or you decide to purchase some brand new gear from ShopKeep, you will be saving money on all fronts. Overall, if you like either of the other two options listed here but can’t afford them, ShopKeep is seriously the next best thing, as it will save you a little bit of money. Of course, there are some features that will you need to b willing to sacrifice in return for that price cut. All three of these POS systems offer something different for their users. Lightspeed has an impeccable design but can be clunky. Revel is highly expensive but is super rich in features, and lastly, ShopKeep is a great entry level POS but because of this, it is severely lacking in the features department. Ultimately, whichever POS platform you choose to go with for your beauty supply business, the only *right* choice, is the choice that makes the most sense for you and your store. If you have a favorite POS platform that you would like to see reviewed, please leave a comment and let us know!